Tartine is a fancy French word for an open-faced sandwich. And we have to be honest - we chose to use it to sound a little fancier here. 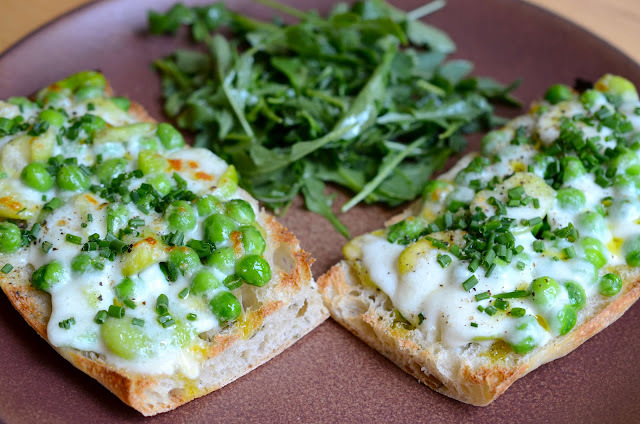 But this simple dish that Michael created deserves some fanciness; it is all that's glorious about spring, spread over focaccia and covered with melted fresh mozzarella. Some chopped chives and a drizzle of good olive oil finish it off. Please, eat this for lunch or dinner sometime soon while the shell beans are in their prime. And if you haven't gotten yourself some fancy olive oil, I must recommend it. I was given some Laudemio as a gift from a very thoughtful and generous parent of one of my preschool students, and we have thoroughly enjoyed it. We've found that it's not worth using for cooking or even in salad dressing - you don't really taste it - but it adds a wonderful flavor when drizzled on top of pasta, risotto, or of course this lovely tartine.